Anatomy of the eye includes lacrimal gland, cornea, conjunctiva, uvea (iris, choroid & ciliary body), lens, blood supply, retina, vitreous & optic-nerve. For ophthalmologists, optometrists, medical, dental, and optometry students, eye-anatomy forms the basis for eye-pathology in diseases: dry eye, retinal detachment, macular degeneration, diabetic retinopathy, eye-trauma etc. What is the thickness of the sclera? The choroid is that part of the uveal tract extending from the edge of the optic nerve head to the ora serrata. The choroid underlies the retinal pigment epithelium and is continuous anteriorly at the ora serrata with the ciliary body. The usually heavily pigmented posterior or choroidal portion of the uveal tract is loosely adherent to the overlying sclera. This plane of loose attachment is a zone of potential separation known as the suprachoroidal space that is common to both the choroidal and ciliary portions of the uveal tract. The suprachoroidal space has relevance for massive choroidal edema, clinically referred to as "choroidal detachments" or in local parlance as "choroidals". Attachment of the longitudinal (meridional) ciliary muscle to the scleral spur limits the space . The enlargement is limited posteriorly by attachment of the choroid to the sclera, augmented by the outward passage of the vortex veins, by the perforating short posterior ciliary arteries and by border tissue at the scleral aperture for the optic nerve. VASCULATURE: The choroid is richly vascular and provides nutrients for the outer portion of the retina including the photoreceptors and the retinal pigment epithelium . It has an extremely rapid blood flow which is provided by the choriocapillaris, inner vascular layer and outer vascular layer. The capillary layer of the choroid, the choriocapillaris, lies directly under Bruch’s membrane and is critical to supply retinal photoreceptors. The larger arteries are found most readily in the outer layers of the posterior choroidal stroma. The long posterior ciliary arteries and their corresponding long ciliary nerves lie within the suprachoroidal space in the horizontal plane, encased by collagenous tissue. Branches from the nerves to the adjacent choroid form small net-like arrangements where large ganglion cells may be observed. The venous drainage system is seen as four vortex systems each located in a posterior quadrant. Each system converges to form a single vestibule, the ampulla, which then exits through the sclera by a vortex vein. STROMA: The choroid contains flattened or interconnecting collagen lamellae that give the melanocytes a spindle shaped appearance. These melanocytes have a stellate shape and contain pigment granules. The cells contain small oval nucleoli. They are usually accompanied by the fibrovascular stroma of the choroid. The melanocytic cells cells are considered to be the source for the most common primary malignant neoplasm of the eye- melanoma. Hogan MJ, Alvarado JA, Weddell JE. Histology of the human eye. Philadelphia: W.B. Saunders, 1971. Last RJ. 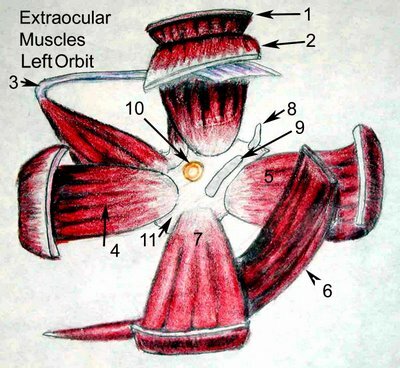 Eugene Wolff’s anatomy of the eye and orbit. Philadelphia: W.B. Saunders, 1961. Strenstrom S. Untersuchungen uber die variation unk kovariation der optishen elemente des menshlickhen auges. Acta Ophthalmol 1946;26:1. Greiner JV, Covington HI, Allansmith MR. Surface morphology of the human upper tarsa conjuctiva. Am J Ophthalmol 1977;83:892-905. Dark AJ, Durrant TE, McGinty F, Shortland JR, et al. Tarsal conjuctiva of the upper eyelid. Am J Ophthalmol 1974;77:555-564. Blumcke S, Morgenroth K Jr. The stereo ultrastructure of the external and internal surface of the cornea. J Ultrastruct Res 1967;18:502. Hogan et al., Histology of the human eye, 202-255. Glasgow BJ. Intraocular fine needle aspiration of coronal adenomas. Diagn Cytopathol 1991;7:239-242. Tolentino FI, Schepens CL, Freeman HM. Vitreoretinal disorders, diagnosis and management. Philadelphia: W.B. Saunders, 1976;1-43. Sebag J, Balazs EA. Morphology and ultrastructure of human vitreous fibers. Invest Ophthalmol Vis Sci 1989;30:1867-1871. Foos RY. Vitreoretinal juncture: topographical variations. Invest Ophthalmol Vis Sci 1972;10:801-808. Foos RY. Anatomic and pathologic aspects of the vitreous body. Trans Am Acad Ophthalmol Otolaryngol 1973;77:OP171-OP183. Gartner J. Histologische Beobachtugen uber physiologische vitreovaskulare. Adharenzen Klin Mbl Augen 1962;141:530-545. Foos RY. Vitreous base, retinal tufts, and retinal tears: pathogenic relationships. In: Pruett RC and Regan CCJ, ed. Retina Congress. New York: Appleton-Century-Crofts, 1974. What is the blood supply to the choroid? 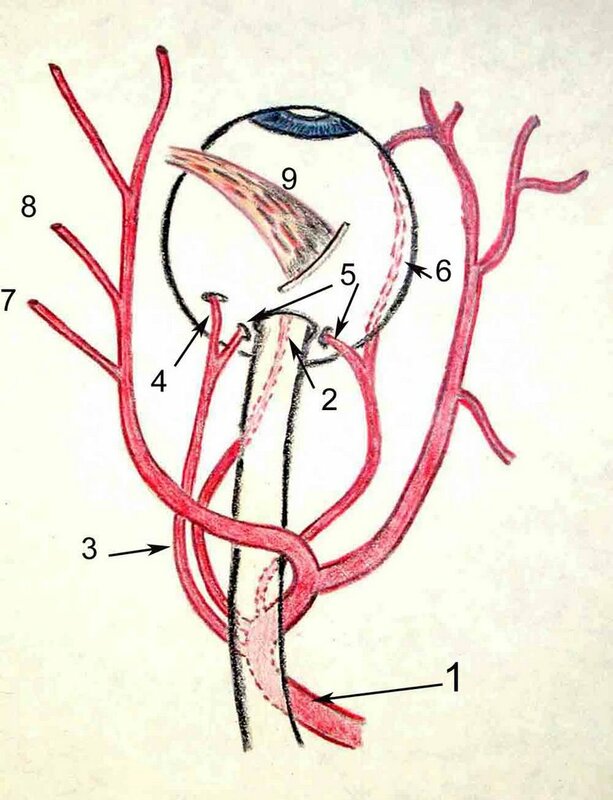 The blood supply to the choroid comes ultimately from the ophthalmic artery (#1 in figure). There are variations but quite posterior branches will become the central retinal artery (#2 in Figure), and ciliary arteries (#3 in Figure) on each side of the optic nerve. These vessels divide into 2 long posterior ciliary arteries(#4 in Figure) and ~20 short posterior ciliary arteries (only one on each side is shown in the diagram #5 in Figure) that enter the eye immediately adjacent and around the optic nerve. The short posterior ciliary arteries directly supply the choroid and the long posterior ciliary arteries travel in the suprachoroidal space anteriorly (#6 in Figure) then supply the choroid anteriorly via recurrent branches. The ophthalmic artery (#1 in Figure) continues to provide branches for the posterior (#7 in Figure) and anterior (#8 in Figure) ethmoidal vessels. The superior oblique muscle is shown for orientation ( #9 in Figure). Blood in the choroid circulates through the choriocapillaries and larger vessels of the choroid to drain into 4-6 vortex veins. 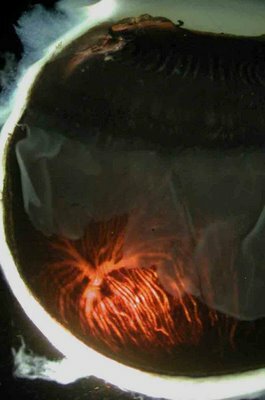 In the photograph of a transilluminated portion of the eye in which the retina has been cut away the whorled vortices of the choroidal veins are evident as they coalesce and drain into a single vortex vein. (Also see #1 in Figure drawing). The vortex veins emerge just posterior to the equator (#2 in Figure) in quadrants. The superotemporal and superonasal (#1 and 2 in Figure) vortex veins will drain into the superior ophthalmic vein. The inferonasal and inferotemporal vortex veins will drain into the inferior ophthalmic vein. These vessels will eventually exit via the cavernous sinus (#5 in Figure). The vortex veins anastomose with the anterior ciliary veins (not shown in the figures). The anterior ciliary veins normally carry blood only from the anterior ciliary muscle, but if the vortex veins are occluded (e.g. from a poorly placed scleral buckle) the anterior ciliary veins may become quite dilated. The superotemporal ophthalmic vein usually exits the eye directly adjacent to or underneath the superior oblique tendon. This has clinical implications for approaches to surgery in which the superior oblique tendon is recessed. Note that the superior ophthalmic vein moves inferiorly and temporally to exit the eye in the superior orbital fissure. This anatomic feature is important when evaluating radiologic studies for carotid cavernous fistula in which the superior ophthalmic vein is enlarged. The inferior ophthalmic vein is said to pass thru the inferior orbital fissure in section 2 of the BCSC. This may not be correct. Most texts show that it either communicates with the pterygoid plexus in the inferior orbital fissure but then either joins the superior ophthalmic vein or exits separately through the superior orbital fissue. The circulation of the anterior portion of the eye features an intricately anastomotic system that essentially join the anterior ciliary circulation and the long posterior ciliary circulation in 3 interconnected arterial circles, an episcleral circle where episcleral vessels join, an intramuscular ciliary circle and the major arterial iris circle (circumferential vessels in the ciliary body). The anterior ciliary venous system joins conjunctival and episcleral vessels at the limbus. This ends the required information for UCLA students taking the one week required clerkship in Ophthalmology. All others please continue. UCLA OP-264.01 students and Jules Stein residents please continue with the ocular pathology tutorial. The Four Recti Muscles. The four recti muscles arise from a short funnel-shaped tendinous ring called the annulus of Zinn. The annulus of Zinn encloses the optic foramen and a part of the medial end of the superior orbital fissure. There are 2 tendons. The Lower Tendon (of Zinn) is attached to the inferior root of the lesser wing of the sphenoid between the optic foramen and the superior orbital fissure. The lower tendon gives origin to part of the medial and lateral recti and all of the inferior rectus. The Upper Tendon (of Lockwood) arises from the body of the sphenoid, and gives origin to part of the medial and lateral recti and all of the superior rectus muscle. The superior and medial recti muscles are much more closely attached to the dural sheath of the optic nerve. This fact may be responsible for the characteristic pain which accompanies extreme eye movements in retro-bulbar neuritis. Medial Rectus: (4 in the figure) The medial rectus is the largest of the ocular muscles and stronger than the lateral. Origin- The medial rectus muscle, (number 2 in the picture) arises from the annulus of Zinn. It has a wide origin to the medial side of and below the optic foramen from both parts of the common tendon, and from the sheath of the optic nerve. Insertion – The medial rectus inserts medially, in the horizontal meridian about 5.5 mm from the limbus. Blood supply – The medial rectus is supplied by the inferior muscular branch of ophthalmic artery and 2 anterior ciliary arteries. Size – The medial rectus muscle is 40.8 mm long; tendon is 3.7 mm long and 10.3 mm wide. Relationships– Above the medial rectus lies the superior oblique. The ophthalmic artery and its anterior and posterior ethmoidal branches and the posterior ethmoidal, anterior ethmoidal and infratrochlear nerves run between the medial rectus and superior oblique muscles. Below the medial rectus is the orbital floor. Medial to the rectus is orbital fat, separating it from the orbital plate of the ethmoid (ethmoid air cells). Laterally is the central orbital fat. Innervation– The inferior division of the 3rd nerve innervates the medial rectus on its lateral surface at about the junction of its middle and posterior thirds. Action. – The medial rectus is a pure adductor. Inferior Rectus (7 in the figure): The inferior rectus is the shortest of the recti muscles. Origin–It arises below the optic foramen, from the middle slip of the lower common tendon of the annulus of Zinn at the apex of the orbit. Insertion– inserted inferiorly, in vertical meridian about 6.5 mm from the limbus. The inferior rectus is also attached to the lower lid by means of the fascial expansion of its sheath. Relations– Inferior division of the 3rd nerve lies above the muscle, and the optic nerve is separated by orbital fat, and the globe of the eye. Lateral – The nerve to the inferior oblique runs in front of the lateral border of the inferior rectus between it and the lateral rectus. Below is the floor of the orbit, roofing the maxillary sinus. The muscle is in contact with the orbital process of the palatine bone, but more anteriorly it is separated by orbital fat from the orbital plate of the maxilla. Innervation– The inferior rectus is supplied by the inferior division of the 3rd nerve, which enters it on its upper aspect at about the junction of the middle and posterior thirds. Actions – The inferior rectus makes the eye look downwards or medially or wheel-rotates it laterally (extorsion). By means of its fascial expansion it also depresses the lower lid.The principal action is depression which increases as the eye is turned out and is nil when the eye is adducted. The inferior rectus is the only depressor in the abducted position of the eye. Origin – arises from the annulus of Zinn and spans the superior orbital fissure (#8 and #9 in the figure). Size – 40.6 mm long; tendon is 8 mm long and 9.2 mm wide. 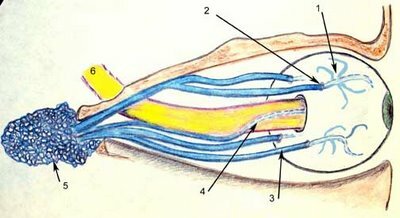 The lateral or external rectus arises from both the lower and upper parts of the common tendon from those portions which bridge the superior orbital (sphenoidal) fissure.The origin is said to assume form of the letter U placed so that the opening faces the optic foramen, the limbs of the U being referred to as the upper and lower heads of the muscle. Relations– The structures which go through the two heads of the lateral rectus, within the cone of muscles or within the annulus of Zinn, have been referred to as the oculomotor foramen.These structures from above downwards are the upper division of the 3rd nerve, the naso-ciliary, and a branch from the sympathetic, then the lower division of the 3rd, then the 6th, and then sometimes the ophthalmic vein or veins.The 6th nerve is actually passing from being below the lower division of the 3rd to lie lateral and in between the two divisions. Innervation– The 6th nerve (abducens) enters it on its medial aspect, just behind its middle. Actions– The lateral rectus is a pure abductor – that is, makes the eye look directly laterally in the horizontal plane. Origin – The superior rectus arises from the upper part of the annulus of Zinn above and to the lateral side of the optic foramen and from the sheath of the optic nerve. This origin lies below that of the levator, and is continuous on the medial side with the medial rectus and on the lateral with the lateral rectus. Blood supply – Superior muscular branch of ophthalmic artery and 2 anterior ciliary a.
Relations– Above the superior rectus is the levator and the frontal nerve, which separate it from the roof of the orbit. Below is the optic nerve, but separated by orbital fat, the ophthalmic artery, and the naso-ciliary nerve. Farther forwards the reflected tendon of the superior oblique passes beneath the superior rectus to reach its insertion. Laterally, in the angle between superior and lateral recti, are found the lacrimal artery and nerve.Medially,the ophthalmic artery and naso-ciliary nerve lie in the angle between the superior rectus and the medial rectus and superior oblique muscles. Innervation – The superior rectus is supplied by the superior division of the oculomotor (3rd cranial), which enters the under-surface of the muscle at the junction of the middle and posterior thirds. Actions – The superior rectus makes the eye look upwards or medially or wheel-rotates it medially (intorts). It also helps the levator to lift the upper lid. Superior Oblique: (3 in the figure)The superior oblique is the longest and thinnest eye muscle. Origin – arises above and medial to the optic foramen by a narrow tendon which partially overlaps the origin of the levator. Insertion – inserted to trochlea at orbital rim, on the medial wall of the antero-superior-medial orbit on the frontal bone. The muscle stops just before the trochlea and then proceeds as tendon under superior rectus posterior to insert on the temporal aspect of the eye behind the equator. Size – 40 mm long; tendon is 20 mm long and 10.8 mm wide. Trochlea- The trochlea consists of a U-shaped piece of fibro-cartilage. The cartilage merges imperceptibly above with fibrous tissue, and is attached to the fovea or spina trochlearis on the frontal bone a few millimeters behind the orbital margin on the medial wall of the orbit. Immediately before entering the pulley striated muscle joins the tendon, which is enclosed in a synovial sheath, beyond which a strong fibrous sheath accompanies the tendon to the eye. Actions – The superior oblique moves the eye downwards or laterally or (wheel-) rotates it inwards (i.e. makes twelve o’clock on the cornea move towards the nose).The principal is the depression, and this increases as the eye is adducted. The superior oblique is the only muscle which can depress in the adducted position. Its action is practically nil when the eye is abducted.The abduction and intorsion are the subsidiary actions, and increase as the eye turns out.The superior oblique acts with the inferior rectus to make the eye look directly down. The abductor component of the action of the oblique muscles is due to their being inserted behind the equator of the globe. Innervation – The superior oblique is supplied by the 4th or trochlear nerve which, having divided into three or four branches, enters the muscle on the upper-surface near its lateral border; the most anterior branch at the junction of the posterior and middle thirds, the most posterior about 8 mm. from its origin. Origin – The inferior oblique is the only extrinsic muscle to take origin from the front of the orbit; arises from a rounded tendon in a depression on orbital floor near orbital rim (maxilla), just behind the orbital margin and lateral to orifice of the naso-lacrimal duct. Some of its fibres may arise from the fascia covering the lacrimal sac. Size – 37 mm long; the shortest tendon of insertion ( essentially no tendon) and it is 9.6 mm wide at insertion. Relations – Near its origin the lower surface of the muscle contacts the periosteum of the orbital floor, laterally it is separated from the floor by fat. Just before the insertion of the muscle, this surface which now faces laterally is covered by the lateral rectus and Tenon's capsule. The upper aspect contacts fat, then the inferior rectus, then finally spreading out and becoming concave it moulds itself on the eye. Innervation– the inferior division of the oculomotor nerve, crosses above the posterior border to enter the muscle on its upper-surface at about the middle of the muscle. Blood-supply comes from the infraorbital artery and the inferior muscular branch of the ophthalmic artery. Actions– The inferior oblique makes the eye look upwards or laterally or wheel-rotates it laterally (extorts). The principal action is the elevation which increases as the eye is turned in and is nil in abduction. The inferior oblique is the only elevator in the adducted position. Levator Palpebrae Superioris Muscle: (1 in the figure) striated muscle to elevate the eyelid.The levator palpebrae superioris arises from the under-surface of the lesser wing of the sphenoid above and in front of the optic foramen by a short tendon which is blended with the underlying origin of the superior rectus.The flat ribbon-like muscle belly 40 mm in length passes forwards below the roof of the orbit and on the superior rectus to about 1 cm. behind the orbital septum (at the upper fornix or a few millimeters in front of the equator of the eye), where it ends in a membranous expansion or aponeurosis. The tendon is about 10-15 mm in length and extend from the equator forward. This spreads out in a fan-shaped manner, so as to occupy the whole breadth of the orbit and thus gives the whole muscle tendon complex the approximate form of an isosceles triangle. Attachments. – (a) The main insertion of the levator is to the skin of the upper lid at and below the upper palpebral sulcus. It reaches this by intercalating with the fibres of the orbicularis. (b) To the Tarsal Plate. – Some of the fibres of the aponeurosis are attached to the front and lower part of the tarsal plate, but the main attachment of the levator here is via the smooth superior palpebral muscle of Muller. This is continuous with the fleshy part of the levator, and is attached to the upper border of the tarsus. Relations– Above the levator and between it and the roof of the orbit are the 4th and frontal nerves and the supraorbital vessels. The 4th nerve crosses the muscle close to its origin from lateral to medial to reach the superior oblique. The supraorbital artery is above the muscle in its anterior half only. The frontal nerve crosses the muscle obliquely from the lateral to the medial side. Below the levator is the medial part of the superior rectus. Innervation– The superior division of the 3rd nerve reaches the muscle either by piercing the medial edge of the superior rectus or curving around its medial border. Action – The levator raises the upper eyelid, thus uncovering the cornea and a portion of the sclera, and deepens the superior palpebral fold. Its antagonist is the palpebral portion of the orbicularis. Muller's muscle- Also known as the superior palpebral muscle is a smooth muscle that acts as an eyelid elevator. Origin- arises from the inferior or bulbar aspect of the levator palpebrae behind the fornix. Relations-lies between the tendon of the levator and the conjunctiva in the eyelid. Muller's muscle begins after the levator muscle has become exclusively tendons.